FRIDAY, Sept. 30 (HealthDay News) -- Louise Borke learned that her infant son had Down Syndrome when he was just a few days old. Her reaction? "Shock and surprise, trepidation and anxiety," she recalls. Today, 22 years later, Borke can look back at life with her son, Louis Sciuto, and say, "It's been fun. It's had its challenges -- I won't deny that -- but it's been fun. It's been rewarding and I have no regrets." Borke is not alone in her views. In a series of recently completed surveys, 96 percent of parents expressed no regrets about having a child with Down Syndrome and nearly eight out of 10 said the child had enhanced their lives by teaching them patience, acceptance and flexibility, among other things. Siblings had similar feelings, with 94 percent feeling "pride" about their sibling and 88 percent saying the sibling had made them a "better person." And virtually all people with Down Syndrome who were queried said they were happy with their lives and liked who they are. "The voices we heard were very satisfied and very positive about their lives despite the fact that they have real challenges," said Dr. Brian Skotko, who conducted the surveys, which appear in the October issue of the American Journal of Medical Genetics. Skotko, a physician with the Down Syndrome Program at Children's Hospital Boston, hopes the results will help families make decisions regarding their unborn babies, especially as prenatal tests become more widely available. Right now, prenatal tests for Down Syndrome run the risk of miscarriage and only about 2 percent of women actually get tested. But new, virtually risk-free blood tests are about to hit the market and Skotko wanted to make sure that parents grappling with this "complex, sensitive, difficult decision" had good information to go by. No one knows exactly how many women who learn their baby will have Down Syndrome through prenatal testing opt to terminate their pregnancies. But small, selected studies suggest the numbers could be as high as 80 percent to 90 percent. "Once everyone has the opportunity to learn prenatally with a simple blood test, what decisions will Americans make about pregnancies and will babies with Down Syndrome slowly start to disappear?" said Skotko. 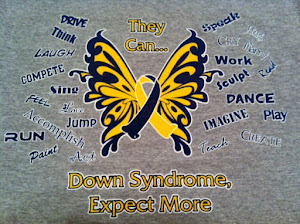 "People with Down Syndrome should be able to describe for Americans what it means to have the condition." Julie Cevallos, vice president of marketing for the National Down Syndrome Society (NDSS), said, "This research is a great new development. What's particularly exciting is that you're hearing from families and siblings and self-advocates directly. "The more information and the more accurate information coming straight from families [the better]. Sometimes there's inaccurate information out there, or just stereotypes," added Cevallos, who's 2-year-old daughter, Nina, has Down Syndrome. Skotko, who is an NDSS board member, has a 32-year-old sister who has Down Syndrome. "She has an active and robust social life, more than I ever had," she related. As for Louis Sciuto, Borke said that he has just landed a job at Target and also has an active social live, keeping up with the latest movies, playing sports and double-dating with friends. What would she tell parents who have learned their child may have Down Syndrome? "I would tell them don't be afraid. It's different but it's not worse. Louis has had friends whose parents have told me that they believe their children are better people for having known Louis."